​The second phase of the low FODMAP diet is all about re-challenging each FODMAP group in isolation. The aim of this is to give you a better understanding of how your body reacts to each of the individual FODMAP groups. With this knowledge you are then able to adapt your long term diet to have as much variety as possible, while still keeping gut symptoms in check. Once you have been on the low FODMAP diet for about 2-6 weeks and have had a significant and consistent reduction on symptoms, it is time to start the re-challenge process. If after 6 weeks your symptoms are not settling it would be time to do some trouble shooting with an experienced dietitian. At this time you are testing the FODMAP and not the food. Once you know how you tolerate each FODMAP group on its own, you can then use this information and apply it to other foods with the same FODMAP or foods with combinations of FODMAPs. It is important to choose Challenge foods carefully to only include only one FODMAP group. This way if you do find the food upsets you, you will know exactly which FODMAP group is to blame. For example, the only FODMAP in Mango is excess fructose, so if you react to mango you will know it was excess fructose that triggered it. On the other hand, an apple contains both fructose and sorbitol, so if you react to an apple, you won’t know which of these two FODMAPs is the problem. To get answers re-challenges may involve eating foods that you wouldn’t normally eat, but you will get the greatest information about your triggers and thresholds. There are 3 different challenge schedules that I use regularly. There is no right or wrong schedule to use, except the one that you find the most “doable” or suits your needs. Consecutive day challenge:Eat the challenge food three days in a row, starting with a small amount of the challenge food and increasing the serve size on each challenge day. Extended challenge:Eat the challenge food in increasing serve sizes, but take a day or two rest between challenge doses. Simplified challenge:Choose a challenge food and eat the same serve size at least three times during the challenge week. The order you choose to do challenges doesn’t matter too much. Fructose and lactose are two of the simpler challenges, so this is sometimes a good place to start. With the exception of the challenge food, it is important to keep the rest of your diet low FODMAP. 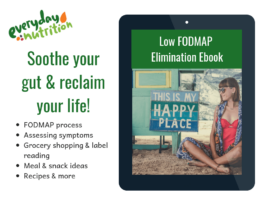 Even if you have successfully completed a challenge, you still need to remove this FODMAP group during other FODMAP challenges. Keep other non-FODMAP triggers, like coffee, alcohol, spicy foods or carbonated drinks, consistent during testing phase. Additionally, do not take unnecessary supplements, medications or probiotics as these may also cloud results. You are looking for your usual gut symptoms that prompted you to try the low FODMAP diet in the first place. While in general we see that certain FODMAP are more likely to cause diarrhoea and others are more likely to cause bloating, this is not set in stone and can be different for different people. If you are feeling anxious, its good to know that you can stop a challenge at any time and return to the low FODMAP diet. Keep in mind, that some fluctuations in gut symptoms from day to day is quite normal and often reflective of a healthy and balanced diet. Mild alterations in gut function are therefore not a problem and we are more interested in more moderate or severe symptoms that are likely to significantly impact your quality of life. Tip: FODMAPs do not cause physical damage or injury and the goal of the low FODMAP diet is to minimise symptoms to a point where they allow you to improve your overall quality of life. Challenges are intended to provide you with the information so that you can make an informed decision about what you want to eat vs what symptoms you are willing to put up with. There is no right or wrong here. Only you can decide this where your tipping point is and it’s also quite ok for you to make a different decision on different days. If you experience moderate gut upset during a challenge, you can stop the challenge. Take the test food back out of the diet and wait until your gut settles again. When you feel well, take two to three days break before starting the next challenge. If do not experience gut upset during a challenge, consider the challenge passed J. You still need to stop eating the challenge food and wait 3 days before beginning the next challenge. Everyday Nutrition dietitians are trained and have extensive experience in supporting people though all phases of the low FODMAP diet. We have three options that you can use to get support through the Challenge phase of the low FODMAP diet. ​Individual appointment for tailored advice in person in Melbourne or internationally via Skype. Get personalised advice and challenge schedules to find your food freedom. The FODMAP Challenge Club is an online group challenge where we provide schedules, information and recipes to do challenges plus get access to a private group where you can ask us questions along the way and connect with others who are challenging at the same time as you. 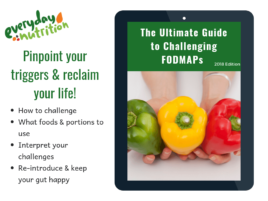 The Ultimate Guide to Challenging FODMAPs is an ebook that you can use to move through challenges at your own pace.